The Lee brothers consider blacksmithing part art, part trade and they have dedicated much of their time to ensure the ancient craft of molding iron lives on. Bent over an anvil, arms flecked with burns, Jeff Lee hammers a red-hot bar of steel with the precision of a master. “Steel is stubborn and as a blacksmith you just have to be more stubborn,” Jeff’s brother Alan said, barely audible over the sounds of the forge and Jeff’s clanking hammer. The Lee brothers have worked as blacksmiths for almost two decades but their relationship with steel predates their years spent sweltering over open flame. In 1978, Jeff and Alan founded Lee Welding Company, a commercial welding business. The pair spent over 22 years fabricating and welding before stumbling into blacksmithing in 2001. When he returned from the conference, Alan brought back home a 120 pound anvil, a one kilogram forging hammer and a pair of tongs. Jeff said he thought his brother had lost his mind. But soon, both brothers began taking blacksmithing classes and joined as many blacksmithing groups as they could attend. Lee Welding Company became Steephollow Forgeworks and “they never looked back,” Alan said. Jeff stood sweltering above his forge, stoking the flames. Once his fire had met some inscrutable standard, he plunged a steel rod deep into a heap of burning coal and ash. When Jeff pulled the steel rod out from under a bed of fire, its tip was glowing yellow. He whipped around, placed the hunk of hot metal on an anvil and swung down his hammer. A few well placed strokes and the steel bar was transformed into a horse’s head. The Lee brothers consider blacksmithing part art, part trade and they have dedicated much of their time to ensure the ancient craft of molding iron lives on. 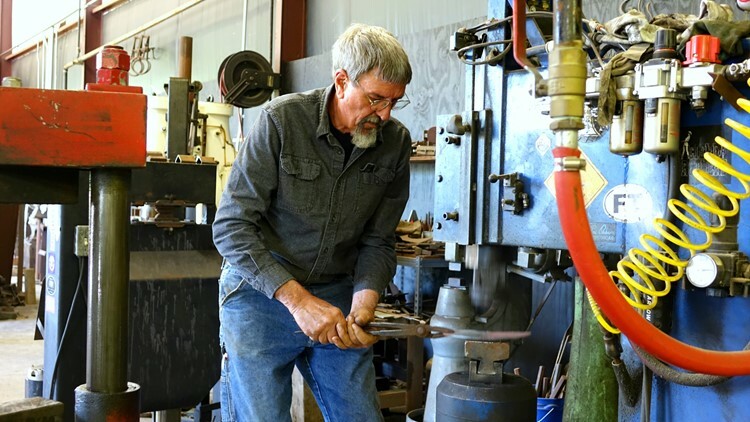 Alan and Jeff offer blacksmithing classes throughout the year and, each February, they host one of the state’s largest blacksmithing conferences Combo-Demo.